Black and white photograph by Geremy Butler Photography showing Hans Coper's 'Thistle Pot' (Crafts Council Collection: P33). Attached to the reverse are printed details relating to the Crafts Advisory Committee' s travelling exhibition Ten British Potters, first shown at the British Crafts Centre from 4 to 13 July 1972, in which this object was exhibit number 33. Handwritten notes have also been added to the label in red and black ink and pencil. 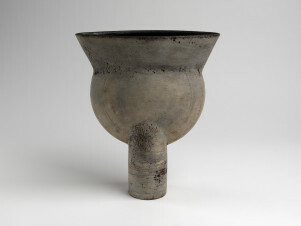 Photograph, 'Thistle Pot' by Hans Coper, photographer Geremy Butler, c.1972. 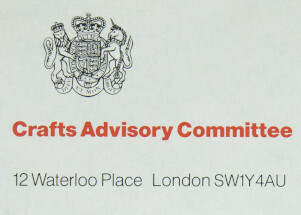 Crafts Council Collection: AM281.